27/02/2013 The German Lesjöfors company Stumpp + Schule has been awarded "2013 Premium Supplier" from Contintental. This award is presented to subcontractors who live up to Continental's high standards of quality and service. Continental is among the world's leading suppliers of components to the automotive industry, providing products such as brake systems, powertrain systems and components, automotive electronics, security systems, and tires. Quality, supply service, competitiveness and willingness to improve and innovate. It is for these strengths that Continental recognises its best suppliers every year. 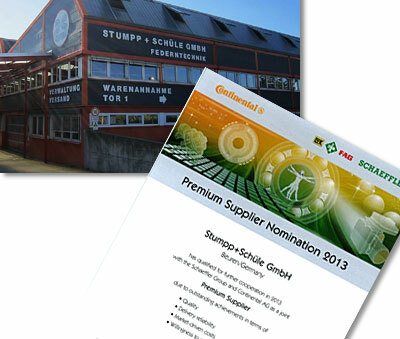 Beuren-based Stumpp + Schule GmbH came top in these categories and are included in the 2013 list of premium suppliers. "We are delighted over the fact that one of our major customers awards us with a top class seal. This distinction is recognized throughout the Schaeffler Group which includes LuK, INA, FAG, Schaeffler and Continental and offers an excellent opportunity to expand the shared business relationship," says Wolfgang Hellman, Sales Manager of Stumpp + Schule. Since 2012, Stumpp + Schule has been a part of the Lesjöfors Group, supplying the automobile industry worldwide with springs and pressings.